Happy Tuesday Everyone! A quick trip to the gym this morning for a spin class and I’m moving a little slow. I came home and made MORE coffee. Perfect. Now I’m feeling a little more pep in my step! Today I’m trying a new recipe called Easy Broccoli Salad. How is it? I found this recipe on one of my favorite blogs. It’s called Nesting with Grace. Her home is so charming and she shares such yummy looking recipes! So I decided to give this one a try! Last night I marinated some chicken for dinner tonight and wanted something healthy and easy to make as a side dish. So, other than frying the bacon, it was quick and easy! On a side note, I’m a little miffed about paying for broccoli by the pound and having to cut off this much and throw it away! I mentioned it to the cashier and she agreed and took $2 off my order. But still. Grrr. I mean it would be different if you could cook it. What a waste. Anyway….Back to the recipe. This is my favorite bowl. I bought it at World Market. Cute, right? In a small bowl mix together mayonnaise, Truvia, and red wine vinegar. Set aside. 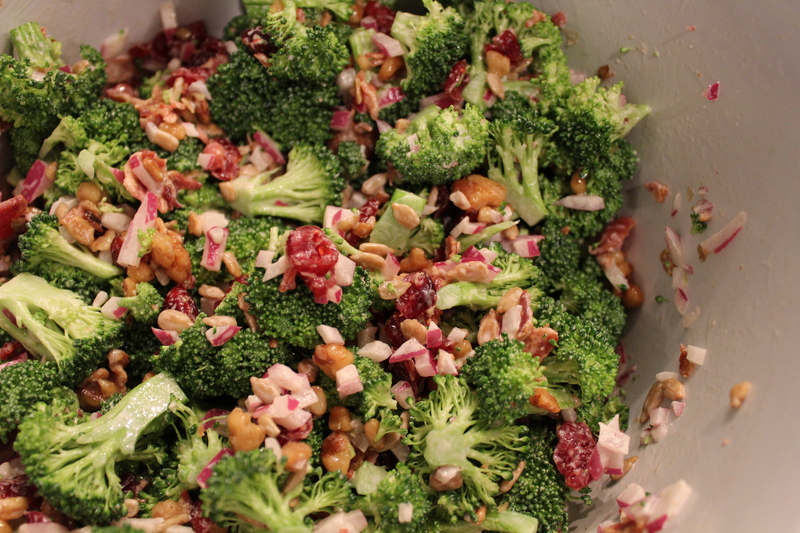 In a large bowl combine broccoli, bacon, sunflower seeds, onion and dried cranberries. When you are ready to serve the salad pour the mayonnaise mixture over the broccoli mixture and coat evenly. This makes about 6 generous servings. NOTE: I added 1/3 cup glazed walnuts for extra flavor. It’s so tasty and crunchy! Also, you could substitute turkey bacon if you wish. TIP: I like to fry a pound of bacon at once. I drain it well on paper towels and store it in an air tight container. It makes cooking breakfast a snap! In the morning I just pull a few pieces out and microwave it and serve it with some scrambled eggs and fruit. Breakfast ready in less than 5 minutes. Perfect for weekdays! I do the same with sausage. I mean why mess up the stove EVERY day? Best Gold Spray Paint EVER. Facebook Marketplace! Are you addicted yet?